Although she first maintains hers is a modest IKEA house, her furnishings and details are much more eclectic than that. 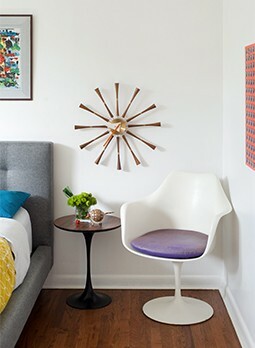 A mustardy Paul McCobb couch, a Bertoia chair and a vintage dining table with knock- off chairs speak with a midcentury accent, while other homey rooms have wicker chairs, stacked antique chests and carefully edited collections of art and objects that fit her particular aesthetic. “If money were no object, I would remove all of the molding around every doorway that a previous owner put in. I had it removed in the kitchen and it made a world of difference,” she says.